Instagram can finally be used in Arabic. The company has rolled out an update that supports three right-to-left languages including Arabic, Farsi & Hebrew. “With this update, we hope more people around the world will be able to connect with the people and interests that matter to them.” the company announced in a statement. According to TechCrunch, the company took all this time to roll out support for RTL languages as it had to reconfigure the entire app. There are more than 63 million users of Instagram in MENA, making it one of the fastest growing communities for the Facebook-owned social network. But the company still took forever to launch support Arabic. According to TechCrunch, that’s because they had to reconfigure the entire app as adding support for RTL languages is not as straightforward as doing it for a language like Spanish. “I’m proud of our efforts to make Instagram one of the most inclusive and diverse platforms in the world. 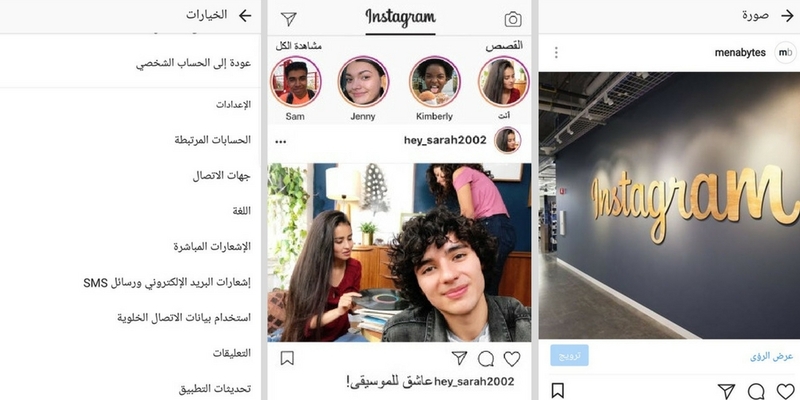 With this update we hope even more Arabic speakers are able to use Instagram to connect with the people and interests that matter to them.” said Instagram’s co-founder Mike Krieger. We’ve tried on two different Instagram accounts and only on one of them we could see the option to change the language to Arabic which means that some users will have to wait before they could see this option. To change the language, you just have to go to settings tab from your profile and look for the “Language” option. If it is already available for you, you’ll be able to see Arabic right at the top of list of languages. Once selected, the app will update to read from right to left.